An action packed opening lap set up a fine afternoon of racing in Italy. A rare safety car appearance led the pack early on before several titanic battles between front running rivals played out before our eyes. There was little time to blink, from the first lap to the last. With dodgy defending, supreme overtaking and some of the year's finest pit work on display, this race offered everything. Re-live the highs and lows of the 2011 Italian Grand Prix with these live text highlights. 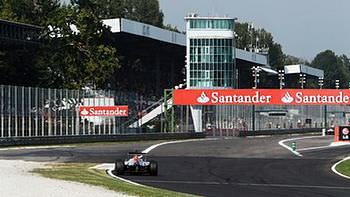 Hello there, and welcome to the Factbyte Factbox for the Italian Grand Prix! It's the last race of the European leg of the season, before F1 returns to flyaways until the last race at Brazil in November. Sebastian Vettel has secured yet another pole position - bringing Red Bull's tally up to 13, one for every single race of the year. The last few races have been pretty cool and damp, which doesn't help Ferrari and their tyres. So far this weekend, it's been sunny over Monza, but the forecasts suggest rain today. Not all reports from the ground agree with that though. Tweet from @5LiveF1: Hello everyone! Stunning weather at an awesome venue and hopefully a brilliant race ahead! Tweet from @JRobertsF1: One hour before the start of the Italian Grand Prix. Thinking that I might head down to the sunshine at the first chicane to enjoy this one. It's Ferrari's home track, the fans are filling the grandstands, and they'll be hoping to do well to give them something to cheer about. Fernando Alonso starts from 4th, with Felipe Massa 6th. Qualifying yesterday didn't offer up too many surprises, although it's worth noting that Jaime Alguersuari dropped out of Q1 and will start 18th. Whenever the Toro Rosso boys start way down the order, they seem to come up through and into the points, so he may be one to keep an eye on. This weekend, the FIA have introduced the double DRS concept again, only this time there are two distinct detection and activation zones. One DRS zone is along the start/finish straight, and the other is between the second Lesmo and the Ascari chicane. We've not seen double DRS done like this before, so it'll be interesting to see if it makes any difference. F1 pitlane walkabout, via @WilliamsF1Team. If you're following qualifying today, please do join in the Sidepodcast comments: https://sidepodcast.com/dashboard The dashboard has comments, FBFB and Twitter all in one place. Also make sure you vote on this week's poll, available here: https://sidepodcast.com/post/live-italy-2011-the-race or on Facebook: https://www.facebook.com/questions/10150291377348878/?qa_ref=qd How many places will Webber lose off the line this week? The Australian driver has struggled with his starts for the last couple of races - at Spa, the cars swarmed past him off the line. Today he starts from fifth on the grid. Jarno Trulli has plenty to smile about this weekend - it's his home race, he has new power steering, he outqualified Heikki Kovalainen AND he's been confirmed at Lotus for 2012. Nico Rosberg qualified 9th, but will start the race on the harder compound tyre - a different strategy to the rest of the field, and to his teammate Michael Schumacher, who starts 8th. The two compounds this weekend are the mediums - white sidewalls - and the soft compounds - yellow sidewalls. Vettel's qualifying time was half a second over the following McLaren drivers - both of whom were surprised at the Red Bull's speed. It's not meant to be an RBR track. Both Lewis Hamilton and Jenson Button felt they could only have got a couple of tenths more out of the car - not half a second. Button is keeping hope that pole position is not the be all and end all this year, though. The Williams drivers seem to be having a slightly better weekend so far. Pastor Maldonado crashed in qualifying and knocked his front wing off, yet still managed to qualify 14th. Rubens Barrichello will start 13th, so they are firmly in the midfield. Michael Schumacher on the split strategy at Mercedes: "We are on a different strategy, but that's good for the team. One of us can take advantage of this, maybe both. Let's see which is the better one." Bruno Senna just scraped through into the third session of qualifying, knocking Paul di Resta out of the top ten. He did not set a time in Q3, and will start tenth. Tweet from @clubforce: Both drivers strapped in. Pit lane opens very soon. It's gonna be a hot afternoon! The pitlane is open and the cars are heading out onto track for their installation laps. HRT are ready for action, via @HRTF1Team. BBC's Lee McKenzie fact: Jenson Button has made more overtaking moves than anyone else this season so far... although that's probably because he has qualified lower than he would have liked. Tweet from @byronf1: Schumacher being pushed back into the garage. Wonder what that's about ? Sebastian Vettel is pushed through the grid to take his position at the front of the pack. Lots of whistles being blown on the grid as the cars make their way through. McLaren are next. A crazy fast lap and a relatively long pit lane are some of the characteristics here at Monza. Martin Brundle fact: The Safety Car has only been used three times in the last ten years at Monza. Red Bull have also split their strategy between drivers. Sebastian Vettel has a shorter seventh gear to Mark. Jenson Button on lining up near to his teammate: "I think it's every man for himself out there, which it should be. We're pretty intelligent, we know what we're doing, we're not going to trip over each other, hopefully. It's so hot today, I think it's going to be tough on the tyres. Two DRS zones is going to be very interesting, I think it's going to make a massive difference." Jenson Button has thoughts on Red Bull's gear strategy split - he suggests they don't have a decent gear ratio for Monza, so they've split to hope one of the less favourable options pans out. It doesn't look like there's a cloud in the sky, so any of those forecasts of rain are just plain wrong. Interview with Vitaly Petrov: "Of course we're satisfied to have an interesting weekend. We have some problems but the mechanics did a fantastic job. We'll try and stay near the top six. It's a race, so we'll try to fight with the guys at the front." Rubens on the grid, via @WilliamsF1Team. Interview with Mark Webber: "Shouldn't be too bad. It's nice to have a pretty straightforward GP in terms of decisions weather-wise. Strategy will be interesting, see how the DRS works. KERS, the boys seem relaxed at the moment. Things can change but we've done everything we can. I'm looking forward to a decent start more than anyone. I'll do my best and then head down for the rest of the afternoon." Talking of Mark Webber's starts, the poll is now closed, and 53% think it might be another disaster for him, and he'll lose three or more positions. On Facebook, it's split between 1 or 2 places, and more, but most think he will be heading backwards. At the moment, it's 40 degrees on track, 29 in the air. Very, very sunny. I'll be posting a pretty box with all the info moments before the race starts too. The Ferrari fans are out in full force. A giant flag waves, with crowds of balloons being waved in the Italian flag colours. Much is being made of the fact that Mark Webber does not have a brand new engine this weekend, whilst a lot of the drivers around him do. Engine reliability hasn't been a massive factor so far this year, though. Towards the back of the grid, Daniel Ricciardo has outqualified Liuzzi for the first time since he was promoted to a race seat. They start 23rd and 24th respectively. The top eight are on soft, Rosberg and Senna are on mediums. Di Resta is on the soft tyre, Sutil on the medium. Out of the top ten, they get to choose their tyres, and Force India look to be splitting their strategy as well. The formation lap gets underway. Both Williams, both Toro Rossos and both Lotuses have gone soft, whilst Pérez and Kobayashi have mediums on - the Sauber drivers likely going for a very long first stint. The final four cars all have soft tyres on, that's both Virgins and both HRTs. It looks to be a speedy formation lap, Vettel leads the pack, weaving to keep temperature in the tyres. The back of the pack filters into place, and they wait for the red lights. Alonso came through from fourth to jump Vettel and Hamilton to go into the lead. Big crash in the midfield, lots of cars sideways. We'll need replays on that one. An HRT lost control of the car on the grass at the pit exit, weaved left and right, sideswiped into Petrov. Petrov then collected Rosberg as part of that impact. Both HRTs are out, Rosberg and Liuzzi too. Four retirements on the first lap. Kobayashi's pitting for a new nose. He may have clipped someone. That long first stint has come to nothing. He has put the soft tyres on. Alonso clipped the grass to get into the lead. Liuzzi did the same thing, but lost control, spun over the grass and hit with the cars turning into the first corner. The rest of the pack were backed up but seemed to get through safely. It looks like Daniel Ricciardo didn't make it off the grid, his HRT being pushed out of the way. Bruno Senna has pitted, Jérôme D'Ambrosio has returned to the garage and retired. Barrichello pitted, he's far behind, but is circulating again trying to catch up the field. Alonso and Vettel zoom off into the distance, Hamilton had a slow restart and was passed by Michael Schumacher. In all that fun and games, we missed that Webber did have a poor start, and has fallen just a couple of places to 7th. He was lucky because he was just one car ahead of Petrov. Any slower a start and he could have been that car. Sebastian Vettel has passed Fernando Alonso, all the way round the outside of Curve Grande, and he's back into the lead. Great overtaking from Vettel. Just before that, Webber tried to go round the outside of Massa into turn one. He couldn't scrub off enough speed and lost his front wing. He hasn't made it back to the pitlane, and crashed into the barriers. Webber is out. Schumacher and Hamilton are scrabbling for position in third place. Felipe Massa seems to be continuing without any damage sustained. He's in 8th place, having just passed Paul di Resta. Sergio Pérez is next on his list. So to recap, Vettel leads with Alonso second and Schumacher third. Hamilton is hustling Schumacher for third place. Retirees so far: Webber, D'Ambrosio, Ricciardo, Petrov, Rosberg and Liuzzi. The moment when Vettel takes to the grass to get past Alonso around the outside. Team radio to Hamilton: "Our straight speeds look okay, Schumacher's just very high." Rubens Barrichello seems to be recovering from the early incident mess, he's now 17th, with Glock in front. Maldonado had a great start, up in seventh. He's just been overtaken by Massa but is running well so far. Tweet from @clubforce: Lots of action so far. Paul in P9 chasing Massa, Perez and Maldonado. Adrian recovering after losing out at first corner. Currently P14. Track is clear. Not sure what that was, someone must have run wide. Ooh, the mechanics are pushing Sutil's car out of the way. That's likely the cause of the yellow flag. He was caught up in the first lap stuff and has now retired. Lewis Hamilton makes another attempt before the last corner, pulls alongside Schumacher but just doesn't have enough speed to get past. Another attempt on the main straight ends with the same result. Hamilton finally gets ahead, but with Schumacher using his straight line speed he sweeps back in front. Jenson Button is now closing up behind them both. My One to Watch box doesn't extend to three but there is 0.2 between Hamilton and Schumacher, and 0.3 between Button and Hamilton. It is ridiculously close. Team radio to Massa: "Michael in third position is holding up the two McLarens. They're a second a lap slower than us." Paul di Resta has pitted for his first stop of the day. Schumacher pushed Hamilton onto the grass, losing him time and letting Button through in front. It's now MSC, BUT, HAM. Jenson Button gets past straight away. The Mercedes driver complains on the radio that his rear tyres are starting to go off. Hamilton was also going to pit that lap, the McLaren mechanics were ready in the pitlane, but they changed their mind and he stays out. Ricciardo has rejoined the race. They've managed to fix his car and he's now just 12 laps behind. He rejoined the field in 5th place, Schumacher is 7th. The McLaren mechanics jog out into the pitlane, and Hamilton comes in for his first stop of the day. Jenson Button is a long way ahead of him as he rejoins in sixth. Fernando Alonso pits from second place. It looks like Hamilton came out behind Schumacher as well. That battle may be back on again! Pastor Maldonado pits for the first time, and Bruno Senna comes in for his second visit to the pitlane. Schumacher's defensive driving is starting to get a little bit aggressive. Vettel pits from the lead and comes out still in the lead with acres of free space. Are there any other cars out there? Jaime Alguersuari pits from 8th place. He's working his way up, people. Hamilton asks on the radio if Schumacher made one move to defend the line, it looked like two. McLaren reply that the FIA are looking into it. Bruno Senna muscles his way past Kobayashi for 13th place. Felipe Massa has also pitted, Heikki Kovalainen comes in too. The only driver not to stop yet then is Sergio Pérez. Race Control: Turn one incident on lap one involving Liuzzi will be investigated after the race. Sebastian Vettel sets the fastest lap of the race so far and is storming away at the front. He's got an 11 second lead at the moment. Team radio to Schumacher from Ross Brawn, no less: "Just a reminder, Michael, to leave room at Ascari." The yellow flags are for Kobayashi who has pulled his Sauber car off onto the grass. That radio message to Schumacher wasn't exactly a telling off, but getting big boss man Ross Brawn on the radio to "remind him" of something says all you need to know. The pair are still going at it. I assume there is nothing else happening in the race because we're not seeing it. Team Lotus pitstop, via @MyTeamLotus. Jarno Trulli pits from 15th place. That's the penultimate position with just Timo Glock behind him. Sébastien Buemi has overtaken Maldonado around the outside for 10th place. The Williams is slipping back a little bit now. Team radio to Schumacher from Ross: "Michael, PLEASE make sure you leave room for the car when you move and change direction." Hamilton has finally got the position on Schumacher, whether that was because of those warnings to the Mercedes driver or not, we'll never know! It feels as though Schumacher gave up that fight, really, knowing that he was always going to lose the position, and he might get into trouble trying to defend it. Alguersuari is doing well then, up from 18th place to 9th. We thought this could happen! Buemi also in the points for Toro Rosso. With the Hamilton/Schumacher battle over, the next duel is between Alonso and Button for 2nd place. Pérez still hasn't stopped yet, we're over half distance he has yet to visit the pitlane. Tyres holding up well. Daniel Ricciardo is still circulating for HRT. He is currently below the retired Kobayashi in the order though. If he keeps on going, he should have time to jump him. Alguersuari got the position from Di Resta and moves up to 8th. 18th to 8th... that sounds familiar. Paul di Resta pits - first of the second stoppers. A good clean stop from the Force India crew and he's away with no drama. Interview with Mark Webber: "Got a good run down the straight, braking on the outside and trying to go round the outside, and Felipe started to come across and then I thought I needed to get out of here. I didn't know if he was going to come that far across or not... turned out when I got towards turn two, I started to bail out of the move but those kerbs are so high on the inside that if you clip the inside it launches the car. I think I made contact with him. Trying to get back to the pits, I knew there was some damage, but I didn't know the front wing was jammed underneath the car and then I lost the steering." Yellow flags for Sergio Pérez who has pulled to a stop before turn five. He was doing so well! Button pitted, and Alonso and Hamilton come in at the same time in response. Sebastian Vettel has pitted from the lead, he'll still comfortably be the leader on the way out. Schumacher is up to second now, but still has one more stop to make. Alonso and Button are behind. Jenson Button gets past Fernando Alonso for 3rd, the Ferrari tries to get the position back but has to slot in behind. Tweet from @OfficialSF1Team: Both cars retired due to gear box problems. Ferrari look like they're having trouble with the tyres, now they have both switched to the harder compound. Schumacher pits from second place and will feed back in somewhere near Hamilton. Probably behind. Hamilton flies past as Schumacher exits the pitlane, so it has finally worked out in Lewis' favour. Just fifteen runners remaining now and fifteen laps to go. Ricciardo has made it past Kobayashi but now he has another Sauber to try and beat. He's currently eight laps down on the retired Pérez. Vettel puts in the fastest lap of the race so far, a 1:27.004. If Kovalainen gets to the end in this position, he'll finish 13th - which is a good result for Lotus, even if it is down to retirements. Vettel's lead is up to about 16 seconds now. Button behind with Alonso keeping tabs on the McLaren - 1.5 seconds behind for third. Lewis Hamilton sets a new fast lap - 1:26.941. Buemi and Senna both pit at the same time from 8th and 9th respectively. Senna is now in 10th place, and if he can hold on to it, he can pick up some points on only his second race this year. Felipe Massa pits from 4th place. He's having something of a quiet race after his main rival Webber retired. Alguersuari pits and returns to the track 7th. 18th to 7th now. Hamilton is doing his best to catch Alonso, hoping to overtake the Ferrari for third place and a podium finish. There are just eight laps remaining now though. Buemi and Senna are having a feisty scrap for 9th place. Team radio to Senna: "8 laps to go. If we get past Buemi, we can catch Di Resta as well." Hamilton is catching the Ferrari but the gap is still at 5 seconds and it's a tough ask. Senna has passed Buemi into the first chicane, so now he'll be chasing down Di Resta. The Renault is on the soft tyres which is what's giving him this end of race pace. Tweet from @tonyfernandes: Heikki putting in great laps. Ps. He extended his contract a while ago. Looking at longer term. He's driving awesome. Radio to Paul di Resta warns the driver of an incoming Senna on the different tyre compound. They sound slightly nervous! There are just four laps to go, so any moves are going to be last minute. Tweet from @OfficialLRGP: Yeeeehaaa ! Bruno 9th. Lewis Hamilton chases down a backmarker of Alguersuari, who braked a lot earlier than he expected. Lewis locked up a little, surprised, but no harm done. He gets past easily. Only the top six cars are still on the lead lap. Vettel, Button, Alonso, Hamilton, Schumacher and Massa. From 6th down to 15th, all the drivers are at least one lap down. And the rest are retired. Hamilton has reduced the gap to Alonso to just over a second - no DRS available to him - and he's not going to have time to do it. Sebastian Vettel wins the Italian Grand Prix!! Hamilton closed right up and did attempt a move but he couldn't quite make it, and they crossed the line in that order. So Vettel took another win, with Button and Alonso joining him on the podium. Hamilton fourth and Schumacher fifth. Martin Brundle fact regarding Webber: The first time a Red Bull hasn't finished in the points since Korea 2010. Tweet from @clubforce: Great result for Paul and the team. P8 and 4 precious points. Superb job. Ricciardo did manage to beat Pérez and he crossed the line but won't be classified because he was still 14 laps down. Vettel climbs out of the car, and points that finger at a TV camera. He gives his team a big hug and heads up to the podium "green room". Vettel and Button celebrate their finish. Alonso also makes his way through the line of clapping ladies. Hats and watches, bottles of water and a weigh-in all waiting for them. They all look very happy, smiles all round. Vettel and Alonso discuss his move onto the grass to overtake at the very start. The three make their way to the podium and the National Anthem rings out as the flags are raised. Vettel actually looks quite emotional on the top step of the podium - he and Alonso discuss the great view, presumably of the crowd who are all there cheering. The trophies are handed out, and now it's time for some champagne! Tweet from @MarussiaVirgin: Good work from Timo & Congrats to the team. It's good to be racing with Team Lotus & we expect to see even more from our upgrade at SingGP. Tweet from @ianparkesf1: "Vettel's 8th win. Only 2 drivers have won more in a season - Schumacher (13, 11 and 9, the latter on three occasions), and Mansell (9). Press Conference Quotes - Sebastian Vettel: "Very emotional. This circuit means a lot to me and has been very special. Obviously, my first win here, so when I crossed the line I remembered every single bit. The podium is unbelievable. When you stand up there, you feel so blessed. So many people underneath, filled with people, it's unbelievable. A circuit that has been tough for us to be competitive the last two years. Really the car was amazing, qualifying yesterday and even better in the race today. The start wasn't that good. Fernando, I didn't know where he was coming from... I was able to pass him, he didn't give me much room... it was just enough. Very enjoyable and then after that it was just fantastic. A great race for us and a very special win. Thanks to all the fans. Obviously last time all the Italian people were cheering a bit more but still, it's very special for me." Press Conference Quotes - Jenson Button: "It was a really fun race, actually. Fighting with Lewis, with Michael and with Fernando. It was a good race, it wasn't for the lead which was a shame, but it was always going to be very difficult. A tough start to the race but a lot of fun. The atmosphere here is fantastic, it's electric. Another good race, we've just got to get everything together on race weekends. Great job by the whole team, just little things we need to work on." Press Conference Quotes - Fernando Alonso: "We've been doing some good starts but always starting fifth or sixth is not enough room to overtake. Here at Monza we knew that if the car was the same good starts, we knew there was enough space to overtake into the first corner... We were leading the race for the first couple of laps but obviously we weren't competitive enough to fight for victory. We had to maximise the podium possibility. As Sebastian mentioned, here in Monza it's very passionate, with the fans at the podium giving you big emotions. Well done to the whole team, a stressful weekend and a lot of pressure. We managed the race as best as possible, with no mistakes." Press Conference Quotes - Sebastian Vettel: "I don't think we took any gamble for today, we took the gamble yesterday in qualifying. Our top speed wasn't high, our gears were probably shorter than the rest of the field. We were not that optimistic in qualifying... but for the race we were pretty confident and we were not afraid of the DRS zones in case we had to battle other people. It worked fantastically well, I was able to pass Fernando without DRS< but with it, it would have been more comfortable a lap later. I think we did the right thing. Great race car, great strategy all the way through." Press Conference Quotes - Fernando Alonso: "We have nothing to lose in the battle with Sebastian. He's leading the championship, so obviously when we have to defend we'll be a bit harder with him. Sorry mate." Press Conference Quotes - Sebastian Vettel: "It's been an incredible year so far, to be honest. We've progressed so much as a team.. from last year to this year made incredible steps. I think we've put ourselves in a very good position. I love racing, we enjoy racing as a team every weekend. Unpacking the car, you can see the passion. You can feel the challenge, we want to make sure we have a good weekend and we squeeze everything out of ourself. It's very nice to win, but if we have a good Sunday and finish third or fifth, we're very good at optimising results. I don't know, I think we'll do Singapore as we've done all the other races this year. Just go there, step by step and see what we can do... I'm looking forward and we'll see what happens then." Tweet from @steveslaterF1: Awesome drive from Vettel. A real champion's race. Button and Alonso well deserved podium places too. Button third successive second place! Tweet from @OfficialLRGP: The Senna name appears in the points scorers list for the first time since Australia 1993. Interview with Ross Brawn: "Obviously deeply disappointed with the start because as you know, we had a different approach with Nico, and it would have been very interesting to see what could have happened with that today. So, that was very frustrating, and then I think Michael drove a fantastic race. We know we haven't got the fastest car but he had a really strong race and the last couple of races we've seen all the things we know about Michael Schumacher. "The FIA were watching it and asked us to be a bit more careful. It's all a balance between racing and not overstepping the mark. Charlie just asked us to leave a bit more room for Lewis which we did. Great racing, fantastic for Formula One, really exciting. "We were talking on the radio about something and he hit the limiter, had a slow gear change. He missed the gear change, that's all it was. It would have been interesting to see how much longer that would have gone on but a little slip from Michael let Lewis through." Interview with Stefano Domenicali: "As you can imagine, not easy considering what happened in Belgium. But you know, today, I think Red Bull were stronger. Congratulations to them, they did a fantastic job. McLaren were strong, but we were able to be there in front of them, at least in front of Lewis. Difficult race and I'm sorry for Felipe because without that touch with Mark he could have been there also for his racing action." Interview with Christian Horner: "It's been an unbelievable day for Seb. A fantastic race. Anybody who thinks he can't overtake, I think he completely disproved that today. Unbelievable for us to win in Monza. We completely didn't expect that result but it was a really dominant drive." Interview with Lewis Hamilton: "It was a good race. I got some points and I finished so I can't really complain. On the restart, Michael was on the outside of me so I was looking at him in my mirrors and before I knew it, the guys had gone. I missed an opportunity to slipstream Sebastian, they caught me napping. But once I finally got past, I was able to chase down, and I had fun chasing down Fernando. "I'm looking forward to the next couple of races, where we go away overseas. It's going to be exciting. We still have six races left, we'll continue to push, and I hope we get some more wins for the team. "We weren't focusing on anyone, that was as fast as we could go. Just lost a little bit on the straights, that's why I couldn't pass Michael, but otherwise it was pretty good." Interview with Bruno Senna: "It was a good race. Of course being in the wrong place at the wrong time in the first corner didn't help my efforts much, because wasted another good qualifying. In fairness, we had a good car and the team did a more racy strategy going for a long stint on the options and that was that. We were fighting for positions right from the back, and going to the points, so that's a very great feeling." Interview with Michael Schumacher: "It was a fun afternoon. I felt I did exactly what I was supposed to do. As far as I understand there was no request for me to see the stewards, so I guess all is in order. "Honestly, I think the start was tremendous and that's where we picked up the positions, but it was a kind of dream to stay, but the dream becomes reality when you start racing these guys. If you look even with only 20 laps to go, Lewis was able to pull a gap of 15 seconds, so you see that the speed of the car is quick enough that we can't really keep them behind us. "It's the nature of the track, in Spa and here, that helped us. The major point why we look certainly better, but definitely we keep on improving and hopefully we will improve further for the next couple of races. We need to close up to the bunch up in front because it's certainly more fun than where we have been." Interview with Felipe Massa: "I was in front of Webber in the second corner, he tried to pass me on the outside and he couldn't. I brake later, I was doing the corner and I was in front of him. He touched me and I spun. Nothing really to say about that, just that, you know, he pushed me out, and it was really unfortunate because I lost all the possibilities I had on my race. "It's really unlucky, we didn't start and finish in the right position. I'm not very happy because of that. We need to concentrate and work hard in Singapore to start and finish in the right position which is not what's happening in many races this year." Interview with Paul di Resta: "My launch wasn't very good but the guys around me didn't get it either. It was a bit strange really because the pre-launch was good but going into turn one I could just see a Williams lunging up the inside of me. I went to the outside as far as I could but there was no way to avoid it, and I had to bump across the chicane. But really, from there, we lost a few positions, just unlucky at race starts, it was a bit of a tangle, and I had to back out. "We went aggressive on the tyre strategy, I think we extracted as much as we could from what we had. Ultimate lap time just wasn't there. You could see Jaime Alguersuari was a bit quicker, but we'll take those four points, it does us a good steed for the constructor's championship now we've overtaken Sauber." A snap of the first corner carnage - lots of drivers got caught up and held up in this which messed up a lot of strategies. That picture courtesy of @JRobertsF1. All drivers barring Bruno Senna (and those retired, obviously) completed two laps. Bruno was on a two-stop strategy but had an extra stop from the first lap fiasco. Once again, Jaime Alguersuari soared up the field. From 18th on the grid, and a very disappointing qualifying, he finished 7th, snugly in the points, and three places ahead of his teammate. Red Bull managed to a win a race they weren't expecting to, a race that doesn't suit their car, which really shows how unbeatable they are. Towards the back of the field, both Williams drivers finished, and both Lotus drivers also. They were two by two, showing their own relative pace. Kovalainen finished 13th, by dint of retirements. Ferrari seem more satisfied with their weekend, Alonso on the podium, and Massa battling for sixth place - not of his own doing either. Overall, it was an intriguing race. We saw a big start line crash, the first proper incident on the first lap we've seen in a while. There were only a few major battles to watch out for, and they dominated the race (a bit too much if you ask me). Watching Hamilton versus Schumacher was fun, but never-ending. Alonso and Button was also fascinating viewing. It's a shame there wasn't a bit more variety out on track today though. The action rolls on to Singapore next time, with the season-ending flyaways getting underway. Sebastian Vettel could secure the championship in Singapore, but it is more likely he'll achieve it in Japan. Either way, we're going to have a good few races after the title has been decided. It matters not though, as the racing has eclipsed the battle for the title this season. There's no reason it shouldn't stay like that to the end of the year. The Singapore Grand Prix is on the 25th September. I'll be back with the FBFB for both qualifying and the race, I hope you'll join me then. Until we meet again, fact fans, have fun and stay safe.